You are here: Home / Recipes / Appetizers / Crispy Coca-Cola Oven Baked Chicken Wings For The Win! Crispy Coca-Cola Oven Baked Chicken Wings For The Win! 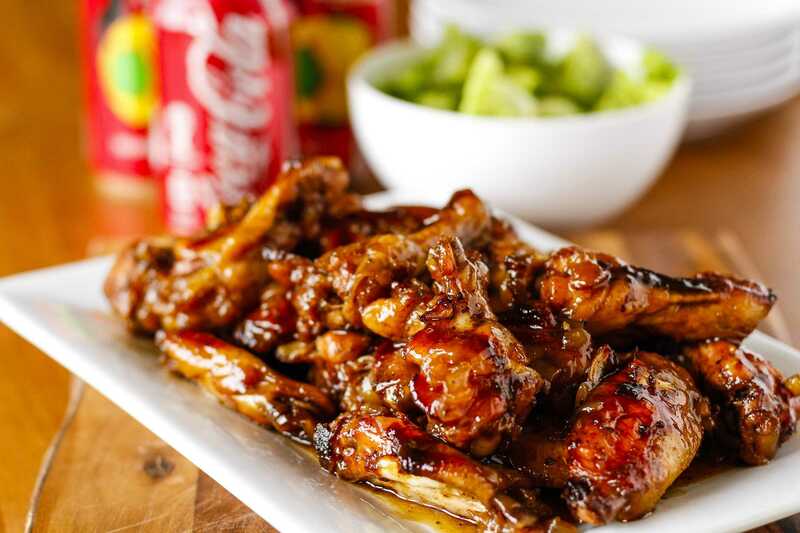 Don’t miss these crispy Coca-Cola baked chicken wings smothered in a sweet and tangy sauce… Oven baked chicken wings are PERFECT for game day and beyond! To say that my husband loves wings would be an understatement… If we’re dining out, nine times out of ten, he orders wings with his meal. And it’s a good thing I did. Don’t get me wrong, the first batch of baked chicken wings was good. But they weren’t the out-of-this-world good that I really wanted to achieve. While I give the baked chicken wings recipe high marks for ease of preparation as written, it called for baking the wings in the sauce, which left the wings a little overcooked and gummy. Blah..
With a little research, I learned that parboiling the wings first makes them extra crispy, so I figured I’d give that a try. I also baked them on a wire rack placed over a baking sheet for good measure, waiting to coat them with the Coca-Cola BBQ sauce until the last five minutes. Finally, I prepared the Coca-Cola BBQ sauce entirely on the stovetop (instead of just finishing it on the stovetop) while the chicken wings were baking. All in all, my method is a little more hands-on, but the total preparation and cooking time is actually much shorter. And the results are worth it! 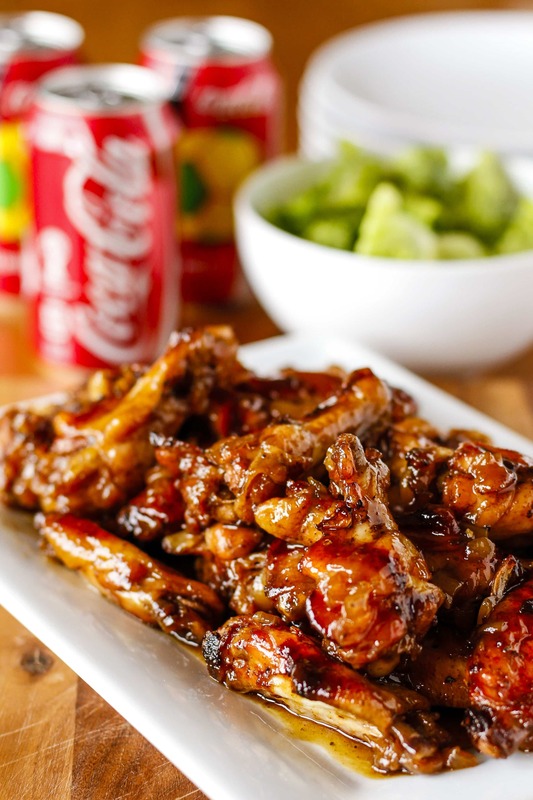 The Coca-Cola in the baked chicken wings sauce gives it a sweet, tangy flavor, similar to a teriyaki. I added about a teaspoon of chipotle powder because my husband likes some heat, but if you prefer a milder, less spicy flavor, feel free to omit it. Either way, it’s a fantastic combination! As you can imagine, she was thrilled to see these limited edition cans. We’ve been watching as many of the games as we can as a family, and we’re looking forward to seeing the U.S. Men’s Team take on Ghana this Monday! I really liked the sauce in this recipe but not the texture of the parboiled chicken. For those who prefer a crispier skin on your wings, I suggest skipping that step, turn the temperature down to 425, cooking the wings a little longer to crisp the skin, and then pick the recipe up at step 4.